Whether it is your first home or fifth, knowing what to expect in the process can be a great comfort to most borrowers. You discuss your needs and goals with a loan specialist. The loan specialist will gather information from you on the loan application, and get that signed by you along with the proper disclosures required by law. In addition to the application and disclosures, you will need to send various income and asset documentation that will be used to verify your ability to repay the loan. A credit report will be obtained, and the loan specialist will make you aware of any derogatory items on the credit that may need to be addressed. Once the credit has been analyzed and the application, disclosures, and income documents have been received, the loan specialist will compile that information and find you the best loan options to fit your personal needs. The loan specialist will deliver a pre-approved loan. This document is the maximum value for which you are pre-approved to buy. With this document, you and your Realtor begin the search and select the property that comes closest to your dreams. when the property you want to buy has been selected, you will be sent the information for this property loan specialist. When a program has been decided upon by the borrower, the loan specialist will submit the loan package into processing. Once in processing status, a processor will order any verifications needed, as well as a title search and appraisal. The processor’s job is to collect all the items needed and prepare the loan file for the underwriter to review.Gathering all of this information can take several days and is greatly dependent on the borrower’s cooperation and the cooperation of the other people involved such as realtors, title companies, appraisers, and the borrower’s employer and banking institutions. Sometimes the processor may contact the borrower to request additional documentation needed to complete the loan file to submit to the underwriter. NOTE: When purchasing a home, the borrower must contact a homeowner’s insurance company to arrange for hazard insurance coverage on the home. It is recommended that this process begin at least two weeks prior to closing, in case there is an unforeseen issue such as the home being in a flood zone.Once the borrower has decided which company will be used, that information must be forwarded to the mortgage company to prepare the policy for the closing. The underwriter has an extremely important role and is basically the one person that either approves the loan or declines it.The underwriter analyzes a borrower’s finances to determine if he or she is an acceptable risk for the mortgage lender to guarantee the funds to purchase the home or payoff the existing lien holder of the property. It is extremely important that the underwriter has all the documentation needed to build a strong financial picture because an underwriter’s job is on the line with every loan they approve. Their approval depends on their ability to approve good borrower files and decline weak ones to limit the risk of loss due to foreclosure and default. In reaching a decision on your application, the underwriter will take into consideration your income, credit, cash reserves and the property itself. If you meet the requirements of the guidelines for the program and the underwriter feels that you are a good risk, a conditional approval will be granted which will list the remaining items needed for the lender to issue funds to close the loan. If the underwriter feels that the file is too risky or outside of their lending guidelines, they will issue a denial, and we may need to look at some alternative lending scenarios. Sometimes the underwriter will request additional information from the borrower to clarify or answer some questions about your financial picture. Remember that we are totally dependent upon convincing the underwriter to approve your loan, so please work with your loan specialist and processor to quickly gather any additional information that the underwriter may need. Many times we can get the information to the underwriter within 24 hours while they are still familiar with the file and can get an approval that same day. Once we have a conditional approval, we can prepare the documents for your closing. An appraisal will be completed on your property to determine the fair market value. The appraiser’s job is to determine the fair market value of the home you are buying or refinancing. Appraisers do this by verifying the physical characteristics of the house and land. This will be done through a personal inspection of the property to verify its condition, square footage, room count, construction materials used (brick, siding, etc. ), and acreage. The appraiser will contact you to schedule the appraisal if it is a refinance, or contact the selling party if it is a purchase. The cost of an appraisal usually runs between $300 and $400.00, provided the property is not rural, hard to access, or of unusual size or acreage.This amount must be paid in advance, as appraisers are third party contractors and not part of our company. Once the physical characteristics have been verified, the value of the property must be determined by comparing your home to at least three similar homes in your area that have sold within the last 6 to 12 months.Once three homes that meet these criteria have been identified, the exact details of each home will be compared to yours, and adjustments will be made to your home’s value based on each line item detail. A title search must be completed on your home prior to the execution of any new mortgage loan. A title search will identify any liens that have been recorded against your property, search the records at the courthouse to make sure the seller of the property has sole ownership and the legal right to sell the property, and verify that all title and deed conveyances are in order. Once these items are cleared and verified, title insurance may be issued on the property that insures the owner and mortgage company against any claims on the property. Once the underwriter has cleared the file and the title search and appraisal have all been reviewed and are acceptable, a closing can be scheduled. At the closing, a closing agent (or in some states an attorney) will conduct your closing. Prior to you arriving, he or she will have retrieved the accurate tax and insurance information for the home, and will have prepared a preliminary settlement statement that your loan specialist will review with you at least 24 hours prior to closing. While at your closing, you will read and sign numerous documents relative to the purchase (or refinance) of your property. 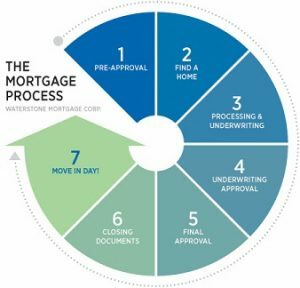 Several of these documents will be familiar to you as they were part of the initial loan application package you signed to start the approval process. The closing agent’s job is to explain the contents of each document that you will sign and be available to answer any questions you may have regarding these documents. The documents then get prepared in the order that the lender has specified, and any legal instruments needed by the county and state governments are recorded. You will receive a copy of all the documents that you sign at the closing. If you want copies of the signed package, you will need to request that from the closing agent. ** It is advisable to locate your “First Payment Letter” in your copy package, and keep it handy. Many times your lender is not able to get your payment statement or coupon book to you in time for your first payment, and you will need to use this first payment letter as a temporary coupon to pay your first month’s payment. It is your responsibility to make sure you make the mortgage payment regardless of whether or not the lender has sent you a statement or coupon, so make sure to keep this handy. The key to making this an enjoyable process for you, the borrower, depends on the loan specialist’s ability to keep you informed of your loan’s status throughout the process. When you are purchasing, and there are other parties involved, these third parties play a huge role in your closing experience by making sure their responsibilities are met. Any number of people involved in the purchase can delay or stop the process for your loan specialist, so please make sure that the other parties involved are willing to cooperate to deliver a wonderful closing experience for you.